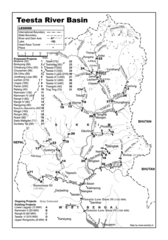 NE India is heavily targeted by hydropower power. However, Affected Citizens of Teesta (ACT) say that these dams pose a serious threat to bio-diversity, and the livelihood of thousands of people. Teesta river is considered a lifeline of Sikkim, a state in north-east India. 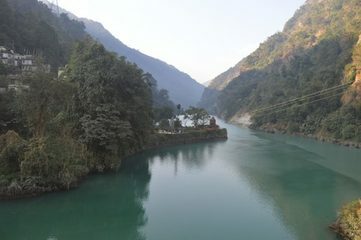 The river originates in the Himalayas, flows through Sikkim and West Bengal before entering into Bangladesh. According to government estimates, Teesta river system has tremendous potential for hydro power generation because Teesta starts from a high elevation of 3,600 metre above sea level to about 300 metre above sea level, covering a distance of more than 175 km. It descends through various rich alpine and temperate forests. 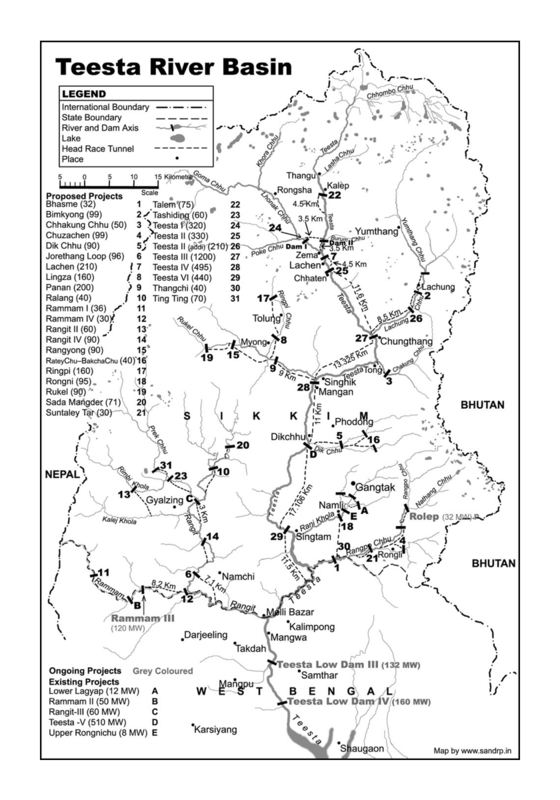 Hydropower generation and distribution in different states is governed by national policies such as the Policy on Hydropower Development 1998 and the New Hydro Policy 2008. Both policies stress on the sustainability of hydropower and therefore the need to exploit it to meet the increasing demand for energy; they encourage financial support for hydropower development from domestic as well as foreign investments. The 2003 National Electricity Act introduced renewed privatisation and deregulation and aimed to attract new investors to the renewable energy market, minimise state intervention, and improve the provision of public goods. This led to major investment in the region by the National Hydro Power Corporation (NHPC) which has 28 dams planned on the Teesta and its tributaries in the Sikkim–Darjeeling Himalaya. Out of these, Teesta V (510 MW) was the first to be taken up, and together with Rangit III (60 MW), Teesta Low Dam Project III (1200 MW), Chuzachen 99 MW project, and Jorethang Loop 96 MW have been already completed. The rest are in different stages of construction. For a comprehensive list, see . The state of Sikkim will get 12 percent of the electricity generated for free, and the remaining power will be supplied to the national grid. However, environment researchers, and civil society organizations such as Affected Citizens of Teesta (ACT) say that these dams pose a serious threat to the bio-diversity, and the livelihood of thousands of people who depend on Teesta. A report of the Delhi based Centre for Inter Disciplinary Studies of Mountain & Hill Environment mentions that the project would lead to loss of biological "wealth which is unique to this region". Comptroller and Auditor General of India also said in its audit report that the project developers were indiscriminately disposing muck which caused degradation of land, air and water. The report also mentioned that the creation of reservoirs, fluctuation in natural river discharge, and diversion of river waters through closed tunnels would completely change the ecological conditions of the river system. “Establishment of the hydro power projects in the state entailed extensive excavation, tunneling, blasting, construction of mammoth water reservoirs, power houses and allied activities. These construction activities put tremendous stress on the fragile environment of the state which could bring about unanticipated disasters and calamities. Unless a robust disaster management plan is prepared and put in place towards prevention and preparedness to face the disasters, the state would suffer tremendous loss of life and property besides long term damage to environment,” quotes the report. The report further pointed that the projects are located in high seismic region-Zone IV where maximum intensity of earthquakes of over 5 in the Richter scale are expected. During the last 50 years, as many as 115 major landslides and nine major earthquakes of the magnitude of more than 5 were recorded. In a major development on June 10th, 2012, the Sikkim government scrapped the construction of 4 hydro power projects (among those not yet commissioned). The reasons for cancellation of the projects include apprehensions following a major earthquake of 6.9 in the Richter scale which hit the region on September 18, 2011. Apart from the earthquake, a strong public opposition and concern over potential environmental impacts also played a role. Civil society groups filed a petition to the National Green Tribunal seeking a halt to all the hydro power projects on Teesta. The case is ongoing. UPDATE: A report in Down to Earth in July 2017 , explained that Dawa Lepcha, a 33 old documentary film maker, was looking for means to rouse his fellow Lepchas against the "irreparable damages" that the proposed dams would cause to North Sikkim's ecosystem. But now, people are paying attention. On June 20, Dawa, and Tenzing Gyatso Lepcha, a student, went on an indefinite fast, demanding all six mega-hydel projects in the Dzongu Lepcha Reserve be scrapped. They've also demanded the state review the impact of all 27 hydel projects proposed. Protesting under the banner of Affected Citizens of Teesta (act), Dawa's group was getting . 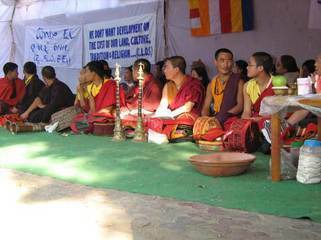 Lepchas from Darjeeling and Kalimpong had been gathering in front of the Bhutia-Lepcha house in Gangtok where the 'satyagrahis' were ensconced. On 6th September, 2017 in Imphal, Manipur, the Eastern Himalayas Peoples Convention on Protection of Indigenous Peoples Land and Natural Resources took place, organized by indigenous peoples organizations in India's North East, which resolved to advance indigenous peoples self determined rights and to protect the land, river, forest, wetlands and other natural resources in the region from any corporate bodies and militaristic development processes, such as mega dam construction over Barak - Brahmaputra River system, Uranium and other mining and to oil exploration process in India's North East State. The final declaration can be found attached atthe end of this data sheet. Project Details Indian government has identified the North Eastern region, where Sikkim is located as a potential power house for the country due to its huge hydro power potential. Sites for developing over 28 hydro electric power projects on the river Teesta and its tributaries in Sikkim have been identified. With these hydro power projects, the government plans to harness electricity worth 5,494 MW in Sikkim. Sikkim will be given 12 percent royalty of the total power generated by the projects for the first 15 years, and beyond 15 years of operation, a royalty of 15% of net energy will be made available to the state. Additionally, 1% additional free power will also be provided for local area development. The government said that these hydro power projects would bring economic benefits through power and employment. However, local communities have rejected these statements of the government. The communities believe that these projects will devastate the region and the state’s fragile ecology. Local communities also fear as the region is highly seismic, and so is prone to earthquake. Teesta Urja Limited (TUL) from India - TUL has been awarded the 1200 MW Teesta Stage III hydro power project for a period of 35 years by Government of Sikkim. Development of Alternatives The tribal community members, including Affected Citizens of Teesta, who are most likely to be affected by these dams advocate that to boost local economy and employment in the region, the government should encourage alternate livelihood options like eco-tourism and home-stays. Activists say that the government could encourage small hydro power projects instead of big dams. Why? Explain briefly. In the name of development, the government is pushing to harness the hydro power potential in Sikkim. This, however, comes at the cost of the fragile ecology of the region, which will be severely affected. Moreover, the lives of the people will be threatened as the region is prone to earthquakes. The plan of development of so many hydro power projects in Sikkim on the Teesta river and its tributaries is not sustainable. Troubled Waters: Why the Lepcha Community in Sikkim is Resisting Its Government’s Attempts to Build Dams Over The River Teesta.